What is the true calling of the intellectual? In this provocative new book, Andrew Shanks presents a distinctive fresh answer. 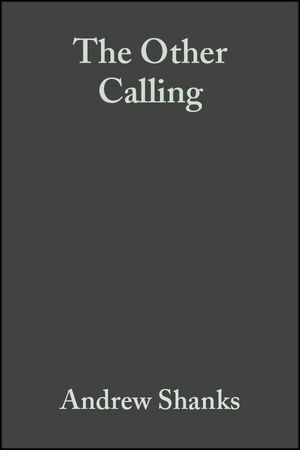 The Other Calling is a systematic riposte both to the elitism of philosophy in the heritage of Plato, and to the typical individualism of Plato's philosophic opponents. Here, instead, intellectual integrity is identified with a form of priesthood. Andrew Shanks is the Canon Theologian for Manchester Cathedral. He is also the author of the following books: Hegel's Political Theology (1991), Civil Society, Civil Religion (Blackwell, 1995), God and Modernity (2000), What is Truth? (2001), and Faith in Honesty (2006). Introduction: Why Theology? / What is an Intellectual?. 1. The Incompleteness of Philosophy Alone. 2. Philosophy and Folk Religion: Two 'Forms' for a Single 'Content'. 3. 'Philosophic Politics' (i): Strauss amongst 'the Moderns' and 'the Postmoderns'. 4. 'Philosophic Politics' (ii): Strauss and 'the Ancients'. 5. Anti-Philosophical Philosophy (i): Kojève's Critique of the 'Cloistered Mind'. 6. Anti-Philosophical Philosophy (ii): Epicurus, Rousseau. 7. Beyond Metaphysics: 'the Science of the Sacralisation of Honesty, in Theist, Catholic form'. 8. Coleridge's Notion of the 'Clerisy'. 10. 'The Conflict': From Amos to Hegel, and Girard. 11. What is an Intellectual? / Why Theology?.